We are nearing year-end and that means it’s time for my annual year in review. This is not an attempt at a quantitative inventory just my assessment of things that happened that will matter in the long run. From my spot it looks like marketing took a big step towards greater relevance in 2013, the importance of being a partner in an ecosystem increased as did the significance of software platforms, and reports of CRM’s demise were greatly exaggerated. It’s not just the fact that Oracle bought Eloqua that made marketing significant and the price reportedly paid, $800 million, still seems light to me. Marketo had a successful IPO, Microsoft bought Net Breeze and Marketing Pilot, and Salesforce.com declared its Marketing Cloud. In 2013 marketing was definitely on the agenda. It also helped that all of the above mentioned companies did something revolutionary for them. Instead of killing their new acquisitions by trying too hard to fit them into the corporate portfolio, the big buyers of 2013 let their new acquisitions figure things out for themselves. You could argue that bringing marketing expertise into some of these companies increased their MQ (marketing IQ) significantly and that they had no choice but to let the experts run things for a bit. The buyers didn’t have much clue in some cases and were more or less forced into it. The approach worked so well that by fall marketers had firm control of their agendas and were leveraging their new companies’ considerable resources to go to war. The best example was the Eloqua Experience user meeting held in San Francisco that attracted a crowd of “modern marketers” sufficient to fill the Hilton Hotel to overflow. Today, Oracle seems to be one of Eloqua’s biggest customers and you can sense it in their go to market approaches. Kudos to Marc Organ, Thor Johnson et al who got the ball rolling ten or so years ago but who were not involved any more by time the big payday came. The traditional partner channel got an upgrade too. Typically, moving to a channel strategy is a great idea for maturing companies that want to reduce overhead by getting someone else to sell for them. Older products under price pressure and margin erosion are frequently what partners get but in 2013 that was less obvious. The leader in the new channel was Salesforce whose partners leverage the core platform to build an impressive array of new products in all areas of the front office and beyond, rather than just adding a little implementation value and customization to an established product. Salesforce’s channel strategy is unlike almost any other. Everybody wins. 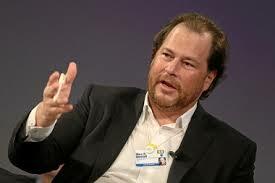 Salesforce has a greatly expanded sales team selling its product and the partners have a well-defined platform and source of raw material on which to build. Everybody wins in this scenario, which is why item three on my list is platform. Also in the partner bucket, Sage decided to simplify its portfolio by selling SalesLogix and ACT! so that it can concentrate on selling SageCRM.com. It’s a good idea but this traditional ERP company still has to prove it understands the CRM market beyond cross-selling it to its accounting customers. Partners and platform reached a crescendo at Dreamforce when Salesforce introduced Salesforce1 calling it a “customer platform” that incorporates Force.com, Heroku, all of CRM, ExactTarget Fuel, and some other bits. Whether you are a partner or an enterprise looking for a Swiss Army knife software tool, Salesforce1 might be what you are looking for. The company went into hyper drive and developed an order of magnitude more APIs that brought it all together so that older apps could peacefully co-exist with newer stuff from all of its acquisitions in a single entity that it hopes will drive enterprise computing for many years. Salesforce is not the only player in the platform space but they’ve typically given themselves a year grace while the rest of the market catches up. Look for Oracle, Microsoft, and SAP to be all over platform in 2014 like white on rice, like a cheap suit, like a junkyard dog, but I don’t want to over state the issue. People have been calling CRM’s demise or at least its radical restructuring since the Clinton administration and they’ve been right but it’s still here. In a late 2013 report, Bluewolf, the consulting group, was at it again. This time, in the company’s second annual survey of the Salesforce customer base, it found that many customers think community will be the new or next CRM. I think this has a lot of validity but…aren’t we already there? To a degree we are and most market observers would, I think, agree that the traditional silos are being rapidly bridged by social to enable greater and more instantaneous information sharing throughout the enterprise. Nonetheless, the importance of the Bluewolf study is not to state the obvious, it is to put a marker down saying watch what happens from here. As the front office continues to socialize you will see more new apps and sectors with increasing benefits. It would be wrong to end without a tip of the hat to Siebel. Bruce Daley pointed out to me that Siebel turned 20 over the summer and to celebrate he re-launched the Siebel Observer to deliver insights on the company and the market on a frequent basis. Siebel is important for multiple reasons. It is the grand daddy of the industry and many of CRM’s brightest stars got their starts there and are now populating numerous other companies and I am happy to say many are friends. Siebel is on a very short list of companies that matter in CRM’s history along with Salesforce and Oracle—Tom, Marc, Craig, Zach, Bruce and many others all came from there and were Larry’s protégés. If you have followed them for any amount of time, last names are superfluous. There were many other highlights during the year and others will no doubt offer their analyses and insights but for me, it’s it and that’s that. It’s been wonderful this spring being a part of all the vendor briefings now in high gear because in short but sometimes painfully dense bursts we get to know what each vendor has in store for the months ahead. It’s a lot and that’s a good sign. There seems to be a breakout happening. One of the themes running through all the events like a kid on a tricycle is marketing. Everywhere you look marketing is making noise. Oracle completed the acquisition of Eloqua, Marketo filed for an IPO, Salesforce is putting significant resources behind its Marketing Cloud and, most importantly, marketers are in the ascent. SiriusDecisions, an analyst firm, is holding a conclave this week in which it is discussing its new marketing waterfall methodology and marketers as well as associated vendors like Lattice-Engines and Full Circle CRM, just to pick two, are sending contingents to the event to see and be seen and to soak up the new marketing vibe. Closer to home, I am attending HubSpot’s second (?) annual analyst day at its Cambridge offices. HubSpot became an early darling of the new marketing movement a few years ago when it turned marketing on its head and said, no, no, no, try this — which turned into inbound marketing — and was very successful. Generally, when marketing kicks it up a notch, as it is doing now, there are a couple economic possibilities. Either we’re entering a new market/category/paradigm or the economy is showing signs of life after a recession and I think it’s possible both are happening right now. The recession is slowly ending and marketing as a discipline is the new paradigm. In fact, and this is most interesting, the marketing upsurge started at the depths of the recession when austerity was big news and almost nothing was getting traction. But it was almost as if the crowd said no, we don’t buy it, let’s get the economy moving again. Let’s go on offense, let’s start marketing and selling again and we’ll spend some money to make it happen. Here’s where economics imitates life — a couple of weeks ago, the economic ideas underpinning the austerity argument, which has devastated Europe and made the sequester in DC a bad word, fell apart. Two Harvard economists named Reinhart and Rogoff whose work had led the austerity charge were proved to have made significant spreadsheet errors. If there was an Oopsie Award they’d win it this year for sure. The translation is that the Austerians (as Paul Krugman likes to call them) got it wrong. The math errors and erroneous assumptions of the Reinhart-Rogoff model were inaccurate and the data did not support their conclusions. Over night austerity is, if not stinking like a dead fish, at least sitting in the sun and beginning to decompose. What’s interesting to me is that the general marketplace began reacting long before the fall of the Reinhart-Rogoff model. No one needed to be hit over the head with an old tire tool to change directions. We’re anything but doctrinaire in this country and when something doesn’t work we make little adjustments, regardless of what officials and supposedly smart people tell us. That’s the beauty of our free market system. It’s distributed and as non-hierarchical as you can get it and it works beautifully in a pinch. In my own mind, I often compare democratic capitalism practices in the West with totalitarian capitalism practiced across the Pacific. The Chinese have a great ability to marshal their people and resources to output great quantities of goods but they still operate in a hierarchical, command and control manner. Democracy and totalitarianism are political systems just as capitalism is an economic one. Politics and economics have to operate together, you need one of each. I could never fathom how totalitarian capitalism could orchestrate the changes I’ve seen this spring. The very idea of individuals deciding for themselves what to do in a confusing market with a totalitarian political system — even with free market capitalism as the economic model — and breaking away from official thinking is hard to imagine. To me that’s part of what CRM captures. It’s the chaotic and the spontaneous that CRM tries to ride herd on. Sometimes it works well and at other times it can fail. But CRM has made important leaps forward. Like economics and sociology or any of the soft sciences, it has come into its own as it has adopted many of the tools of soft science — the bell curve, crowd sourcing, big data and analysis, and, most of all, probability. There’s just no way a political-economic system other than what we have in the West could come to the same conclusion. It would be like asking a fish to invent fire.